Each student who participates in athletics or is involved in a spirit squad in the Arkadelphia Public School District is required to have a current physical examination on file with the school in order to participate during the school year. Thanks to the generosity of local physicians each year, APSD is able to offer a time for your student to have a physical examination free of charge for this purpose. We invite you to take advantage of this opportunity Tuesday, May 7, at Arkadelphia High School. There is no obligation to have your physical taken during this time, but we will eventually need a physical on file in order for your student to begin practicing in the fall or to participate in any summer activities or camps. If you attended last year’s free physicals on May 9, your child’s physical will expire before the fall of 2019 begins, thus the importance of renewing their physical. If you are not able to make this date, a physical from your family physician will be sufficient. We would also like to emphasize that this is not a complete physical and would encourage your student to have a complete physical annually, whether they participate in athletics or not. 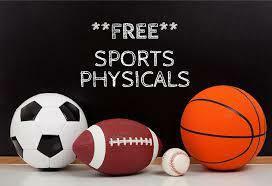 At this link, you will find a questionnaire that will need to be filled out prior to your student taking the physical along with an informational letter about the free physicals. Please fill out the front page and have your child return it to his or her coach by Monday, May 6, or your student may bring it with him/her to the High School on May 7. The coaching staff will bring all of the physical forms that are turned into them to the High School on the afternoon of the physicals and re-distribute them to the students. The physicals will be collected by the coaching staff upon your student’s completion of the physical that afternoon/evening. Note on the questionnaire that some pre-existing conditions could require your student to get a physical from his/her family doctor and therefore they would not need to come to the May 7 event. Below is the schedule for physicals for the evening. Students at Goza may ride the bus to AHS after school to get in line and then be picked up when physicals are complete or parents may bring them any time before 5:30. Students can be dropped off at the high school and will be supervised by coaches and other volunteers. Your student can contact you when they are finished. Depending on attendance, wait time could be up to 1:30 or 2 hours. For more information, contact APSD Athletic Director Donald Williams at donald.williams@arkadelphiaschools.org or APSD Nurse Audrey Eldridge at audrey.eldridge@arkadelphiaschools.org.